Armed robbery is a violent felony. It is among the most serious crimes in Mississippi. Armed robbery can carry a stiffer sentence than manslaughter, aggravated DUI causing death, drug trafficking, shootings, and some forms of murder. Armed robbery can carry up to life in prison, served day-for-day, without parole. while exhibiting a deadly weapon. A person can be convicted of armed robbery even if he just makes an attempt. Under Mississippi law, the crime of armed robbery is complete if attempted. However, the prosecution must prove the defendant committed an overt act toward the commission of armed robbery, in order to convict for attempt. Telling the victim you have a weapon, even if no weapon was actually used. The prosecution must prove the use of a deadly weapon in order to convict for armed robbery. Examples of deadly weapons can include firearms, knives, baseball bats, bricks, golf clubs, broken bottles, and even automobiles. Whether an object is considered as a deadly weapon depends on how it is used. If using the object puts the victim in fear of immediate injury then it qualifies as a deadly weapon, regardless of whether an actual weapon was used, a replica weapon, or an object that appears to be a weapon. The Mississippi Supreme Court has held that (1) when the defendant makes an overt act (2) implying he has a deadly weapon, and (3) the victim reasonably believes the defendant has a deadly weapon, then deadly weapon requirement is satisfied. In one case the defendant pointed his finger in a coat pocket at the cashier, implying he had a firearm. The cashier thought the robber had a pistol and she was terrified. Accordingly, the deadly weapon requirement was met and the conviction was upheld. Thus, an unloaded gun, BB gun, toy gun, or even a toy knife qualifies as a weapon if it was used to place the victim in fear of immediate injury. The element of force can be met regardless of whether violence was used to get the property or force was used as a preventative measure. The doctrine of a lesser included offense originated with double jeopardy and merger. If the prosecution can not prove all the elements of armed robbery, the defendant may receive the benefit of a much less serious offense. The charge of armed robbery can include the lesser offenses of simple robbery, attempted simple robbery, and aggravated assault, but not attempted aggravated assault. The defendant is legally entitled to a jury instruction on the elements of a lesser included offense when it is supported by the evidence. Call now. The police will use aggressive questioning to get the answers they want to hear. The best Mississippi attorneys know you cannot talk your way out of a charge. You have the constitutional right to consult a lawyer first. Call the Law Office of Rufus Alldredge at 228.863.0123. 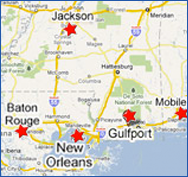 We are located at 1921 22nd Avenue in Gulfport, Mississippi close to the federal and state courts.